Aloha KORE Hui! 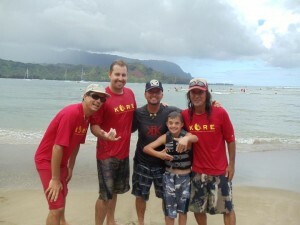 Mahalo to da max for everyones involvement at our last Beach Day. Received so many compliments how professional we were, in and out of the water. The Aloha Spirit is still alive and well at our KORE Beach Day and I once again Mahalo everyone who has been a part of this very special program for our island. People were commenting on how many different activities were happening in the water and on the beach. We have the County bus bringing our friends, surfboards, mobi-chairs, stand ups, live music, coloring hats, ono shave ice, lei making 101, massive amounts of pupu’s, pulehu sausage’s and a healthy dose of ALOHA! For those who were around from Day 1 and had to bring your own surfboard for us to use and even bring your own water and snacks, you’ve seen what the power of the Aloha Spirit can do………it can do anything. Recently, you’ve probably noticed how many more adult participants have been wanting to surf and witnessed how much MANPOWER is needed to accomplish our mission, so, please continue to spread the word about KORE cuz we can never have enough able body people to help support the mission. Remember we’re now on facebook to view pictures and to comment. Aloha again to all for stoking the Island of Kaua’i out and Mahalo for such a perfect ride!